What’s the Deal With Canned Cranberry Sauce? No American holiday conjures up images and memories of food like Thanksgiving. Starting in preschool, most of us learned that Thanksgiving commemorates the moment in 1621 when Pilgrims sat down for a peaceful meal with their Indian friends. They wore funny hats and buckle shoes that are conveniently easy to replicate out of construction paper. They ate turkey, cranberry sauce, pumpkin pie, and stuffing … just like I ate with my family every year in Stanfordville, New York, after watching the Thanksgiving Day parade. 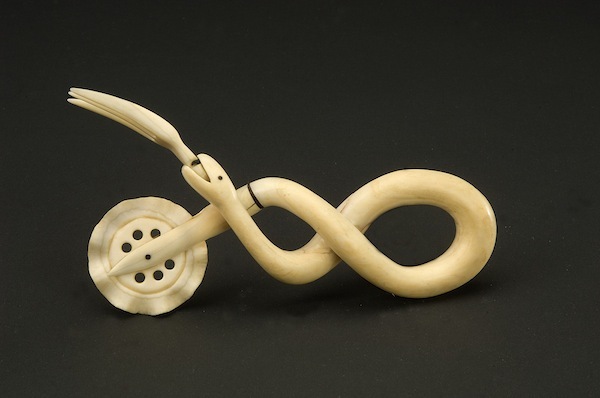 Since the mid-20th century, historians (including those at Plimoth Plantation) have gone to great lengths to prove how little of this story actually happened. Nonetheless, the Thanksgiving meal as we know it today is a cornerstone of our national identity. But why pie? And turkey? And that inescapable canned cranberry sauce? What we choose to remember about the past often says more about America than what actually happened. Thanksgiving betrays a need—which we see throughout American history—to create a shared national identity. And, in this case, the way we have addressed that hunger is by creating shared food traditions. Because very little is known about what actually happened at the “first Thanksgiving,” we’ve been free to commemorate it based on what we’ve needed it to look like over time. Most of what is known about the foods of the “first Thanksgiving” is based on what foods were common at that time in the region, and a letter written by Edward Winslow to a friend in England describing the feast in 1621. Winslow wrote that Governor Bradford of the Plymouth Colony sent men out to hunt wildfowl (most likely goose or duck) while Wampanoag Indians brought deer to the feast. While turkeys were plentiful in New England in the 1620s, historians agree it is unlikely that they were the centerpiece of the “first Thanksgiving.” Turkeys were hard to catch, and the meat was tough and lean. Fish, however, would have been plentiful and almost certainly part of any harvest celebration. The Pilgrims may have stuffed their birds (though most likely not turkeys) with onions and herbs. Cranberries were native to New England and would have been in the native diet in the 1620s, so they could have been part of the Thanksgiving meal, too. If cranberries were in sauce form, the sauce would have been sweetened with maple syrup. We also know that pumpkins, a type of squash, were eaten in 1620s New England, though there was no flour and hence no pies. With very little historical basis on which to create a shared national holiday, America needed someone to tell them how the holiday should be celebrated. And Sarah Josepha Buell Hale was just the woman for the job. Hale, based in Boston, and later Philadelphia, was the editor of Godey’s Ladies Book, a very popular women’s magazine of the mid-19th century. She wanted to create an American tradition that brought people together and, according to historian Anne Blue Wills, hearkened back to the rural, Protestant foundations of the country. As America entered the 20th century, Americans tweaked their Thanksgiving food traditions to reflect the modern vision of America. Progress, innovation, and technology all became part of the Thanksgiving table. Take the beloved cranberry sauce. Cranberries were too delicate to transport long distances and were consumed mostly in New England. But in 1912, Marcus Urann, head of the United Cape Cod Cranberry Company, started packaging and selling canned cranberry sauce under the name Ocean Spray Preserving Company. Now cranberries could enjoy a longer shelf life and become fixtures on the Thanksgiving table far away from cranberry bogs. Stuffing, too, got a modern “upgrade.” The convenience-food revolution of the mid-1900s introduced pre-packaged stuffing mixes to the home kitchen; perfect stuffing became as easy as just adding chicken broth. These same convenience foods in the home earned green bean casserole a place at the Thanksgiving table. Campbell’s Soup Company published the first recipe for green bean casserole in 1955, trying to create a recipe made up entirely of things the “average” cook had on hand. The recipe, which has remained the same for over 50 years, used their cream of mushroom soup, crispy onions, and green beans. Even pies took a turn to convenience with the introduction of canned, pureed pumpkin. Today, the vast majority of pumpkins grown in America are turned into canned pumpkin puree, which takes away the need to bake and mash a real pumpkin. Through these food innovations, every home in America could have a “traditional” Thanksgiving that meshed with the 20th-century vision of a modern America. So nowadays our Thanksgiving feast is as much a tribute to the mid-20th-century modernist ideal as it is to a 19th-century idealized view of our 17th-century origin story. My Thanksgiving meal this year is going to be a mash-up. I can’t give up the canned cranberry sauce, even though locavores might shudder at the idea that I enjoy slicing its jellied perfection on the lines. But I’ve also ordered a “heritage” turkey—a bird that has more in common with a wild turkey than a Butterball—and added fish to the menu as a way to give those around my dinner table a taste of what the Pilgrims might have tasted back then. And I’m also going to add some mutton, as a nod to Hale’s Northwood feast. Thanksgiving not only reflects who Americans are, but who we want to be. And so what I really think Thanksgiving shows is how creative we are in putting new twists on old experiences. is program director of the American Food History Project at the Smithsonian’s National Museum of American History. 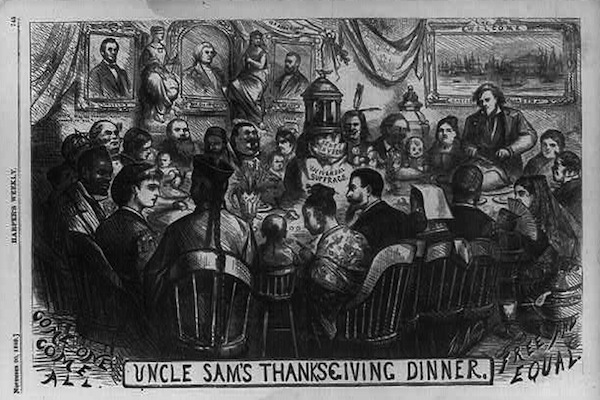 Lead photo and Uncle Sam’s Thanksgiving Dinner courtesy of the Library of Congress. Additional photos courtesy of the Smithsonian’s National Museum of American History. Is Tony Soprano Quintessentially American?